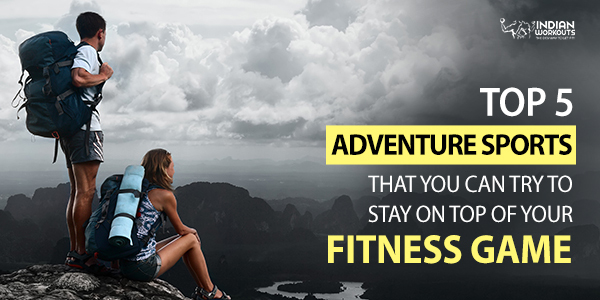 Are you an adventure junkie and simply hate to be confined within the walls of a crowded gym? Well, then you are not alone! You look for that adrenaline rush and pack in a workout without realizing that you have worked out, how cool is that? I am a sucker for adventure sports! But the only time I am remotely close to adventure sports is while watching them on the idiot box. The story of your life too? So are you doing anything to change that? I mean, why just sit on the couch and watch people have the time of their lives while all you get to do is just do mundane stuff? Not fair, right? But you know what, adventure sports are not only about the thrill factor! There is much more to it. In fact, there are a number of reasons why you should jump onto the adventure sports bandwagon. Adventure sports or extreme sports are activities that involve a certain level of danger. So, these kinds of activities promise a whole lot more than physical activity. It involves height, speed, extreme physical exertion and of course some eye-popping stunts which themselves are a definition of an adrenaline rush. 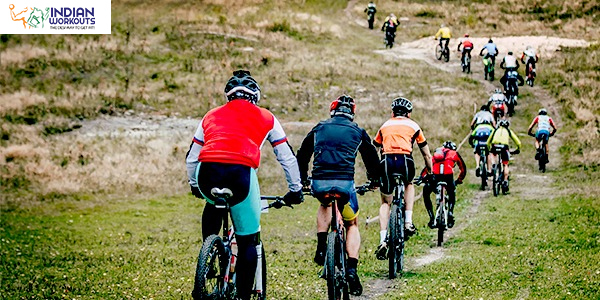 These adventure sports are either competitive or non-competitive and may often involveindividual participants or teams. The thrill and dangers associated with the activities make the mall the more interesting for people who love something extra in their lives, and adventure adds just the right dose of pizzaz in their lives. Read more to find out about the cool reasons why I transformed from a gym junkie to an adventure sports junkie. You have one life, so live it up! Make your journey memorable by doing stuff that you would be proud of. Just think, your body is capable of doing so many things. Why limit it to stuff that your body hates? Let’s get down to the point and find out why adventure sports should be an integral part of your life. Modern lifestyle is making you chained to the desk. Most of us are married to our gadgets and gizmos. Fitness to us means huffing and puffing for a few minutes on the boring gym machines! And that’s the reason our body gets rusty way before it should, we are aren’t able to move anymore. Get out, move more and soak in the sunlight. Trust me, just that morning sunlight tells me that better things are in the offing. Time for you to try that too. Start doing something in the lap of nature, just reconnect to it, it can do incredible things to your mind, body, and soul! Adventure sounds risky, dangerous and a whole lot of fun. Skydiving, bungee-jumping, mountain hiking; well you take your pick, anything that makes you tap the daredevil side of you. While you are pursuing the thrill factor you also get to lose the extra flab, all this by not keeping a hawk’s eye on the weighing scale. Losing weight and staying fit is much more fun when you aren’t constantly bothered about numbers. Sports require you to possess some amount of skill and conditioning, and adventure sports give you just that. It helps hone your mind, body co-ordination skills and eggs you forward to accomplish seemingly impossible goals. In fact, adventure sports can be a perfect way to develop your endurance, strength, and agility. When it comes to me, the most challenging thing is to maintain my interest in the fitness game. I mean, if I do not find it interesting enough, how in the wide world I am going to stick to it? Also, what challenges you keeps you interested. So if you always have new heights to conquer, only then you will remain invested in the process. And adventure sports gives you just that. It gives you both, sustainability and provides you with a fresh spate of challenges! Also, those good hormones, endorphins to be exact, can actually keep depression at bay. So now that you know that adventure sports can literally transform you, what are you waiting for? Tie up your seat belts and go on one helluva ride! 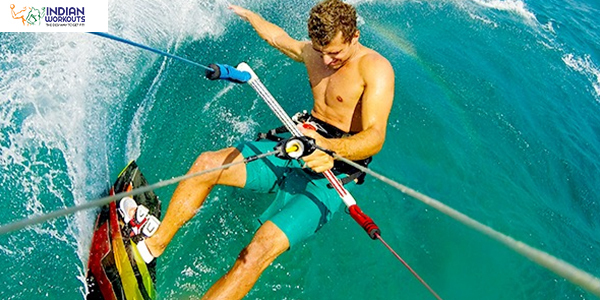 There are too many varieties of adventure sports and you are sure to get spoiled for choice. Zorbing is also known as globe-riding, sphering and/or orbing – The beauty of zorbing is that it is not only a recreational activity butalso helps burn a mean number of calories. You can do zorbing on a gentle slope, but you can even perform it on alevel surface, which helps you to be more in control. Don’t fret if you do not stay in hilly areas. The orbs can be constructedand rolled on wooden, inflatable or metal ramps. As the nature of the orbs is buoyant, zorbing can also be tried on water.Of course, you need to inflate the orb properly and get it sealed once the rider is inside the orb. You can try ‘Water walking’ in such orbs and believe me, it is quite a calorie torcher! These are not part of atheme park in most countries. There are actually two types of orbs that you can try, both the harnessed and non-harnessed. Check out a few more benefits of this unconventional sports fitness. Thrill and adventure- The thrill and excitement you get from zorbing are incomparable, much like other adventure sports. It is great for those fitness enthusiasts who are looking for that extra dose of thrill. It burns a great many calories- Since you exert pressure to rotate the ball, it helps you maintain the balance. 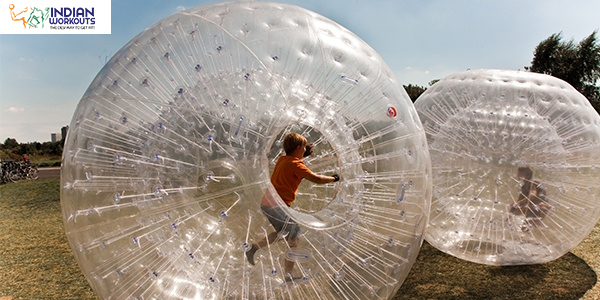 If you zorb for a good 15 minutes, you can get great exercise benefits almost equivalent to jogging for 30 minutes. It is irresistible for both kids and adults- It creates an adrenaline rush as you get to do a whole lot of fun things like crawling, walking, running, bouncing, and falling continuously and then getting up again inside the ball. When you are out on a holiday, you do not want to work out, right? But how about including an activity, which while packing in loads of fun will also help you burn those extra calories you invariably put on during a vacation? Ever tried scuba diving? It is enjoyable and a great adrenaline boosting sport that comes with a great many health benefits. 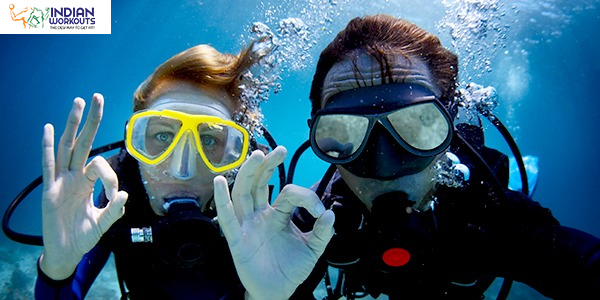 Whether you have just started SCUBA diving or you are an experienced deep sea diver, SCUBA diving has numerous health benefits to offer everyone. It can help you gain strength and flexibility- As you dive into the sea, you swim against the resistance of the water and the more you dive and swim against the tide, the more you build strength, your muscles lengthen and you build up both endurance and flexibility. The right breathing- When you breathe underwater, it helps conserve and optimise your air consumption. Increases the fitness levels- The repeated movements of the legs against the resistance of water can increase your fitness levels significantly. Now this is one of my favorites! Though it gets you dirty, in the end its well worth it because it really challenges your physical prowess. With that exhilarating ride,you won’t quite think of the extra calories you get to burn, but oh boy is it fun and exciting!Riding through a tough terrain or through the woods, holds loads of surprises, and in a good way! Spiked heart rate- Your heart rate goes right up with dirt biking and it is as good as a low endurance workout, in fact, it can bring your heart up to the mid 150’s. Burns major calories- The break-neck speed with which you take your bike on to various terrain works most of your muscles, burning some major calories. Trust me, your core, arm and leg muscles will surely feel the impact after a ride. Dirt biking is certainly one of the most physically demanding adventure sports ever! 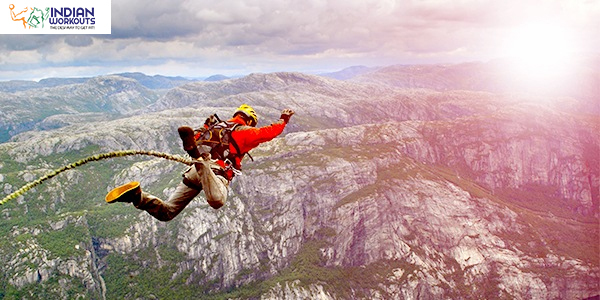 Bungee jumping is one of the most feared yet most tried extreme sports. We don’t know whether you have dared to try it, but it looks absolutely thrilling to jump off an edge, suspended in mid-air just letting go of everything, it can be once in a lifetime experience for sure! Time must surely be suspended for those heart-stopping moments. There may be some people who may think why and how can a person attempt to do some thing like that. Can it possibly have some benefits of the mind and body? There sure can be, let’s find out some of its health benefits. Improves your physical stamina- Needless to say, when you are suspended in mid-air, it just about stretches every muscle in your body. It also improves your physical stamina and reflexes. Your sense of adventure gets satiated- Everyone has this unquenchable thirst for adventure; for some of us the feeling is too dormant for us to recognize and explore it. But whoever has had the experience of bungee jumping, will vouch for the fact that it is the single most exciting thing they have ever attempted to do and it has quenched their thirst for the thrill factor in their lives. 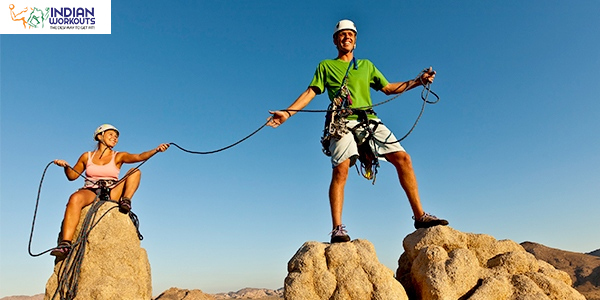 It helps you get stronger- Contrary to popular belief, rock climbing does not only make you gain upper body strength but also needs intricate footwork, lean muscle mass, and lower body strength. It gets your heart pumping and also works as a great cardiovascular workout considering it burns about 700 calories. No wonder most modern gyms are equipping them selves with rock climbing facilities. It helps strengthen your mind- Rock climbing, like many other strenuous physical feats, is more about mind over matter. It helps you think of how to conquer your next hurdle and reach your next goal. It helps improve your body awareness and also enhances your problem climbing skills. 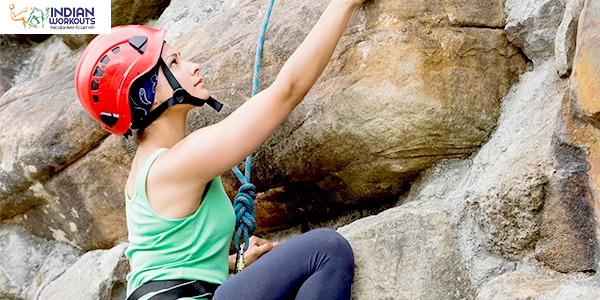 It helps reduce stress- Rock-climbing is a great way to beat stress as climbing helps release a chemical called nor epinephrine which helps balance our brains response to stress. It not only helps you deal with various mental ailments such as addiction, anorexia, and depression; it can even block pain and create a sense of euphoria. So what are you waiting for? Try your hand at adventure sports and you will soon realize it is a blend of unlimited fun and adventure! Let us know whether you have ever tried extreme sports. If you have then let us know which you have enjoyed most!